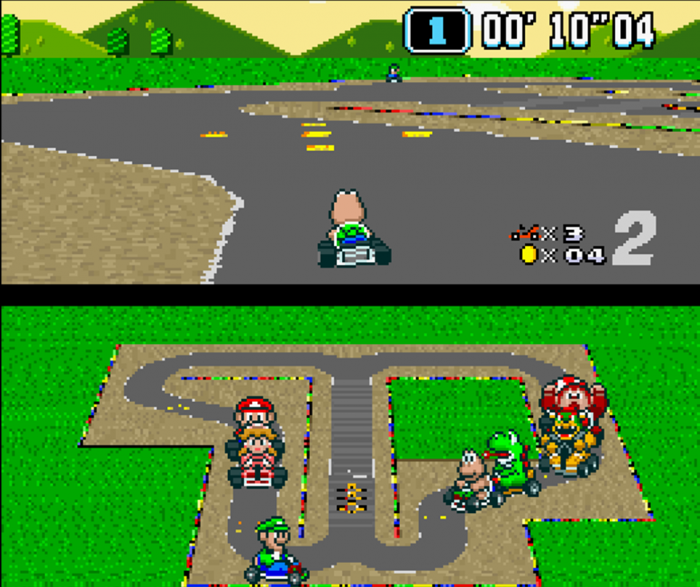 Super Mario Kart Universe is a super nintendo ROM hack based on the super mario kart SNES game. This hack contains the same racers as in the original game and the same tracks, but all the tracks have been completely redesigned. 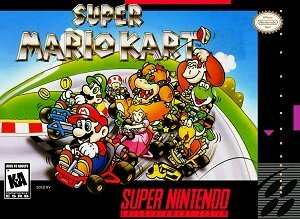 Super mario kart was one of my favourite games that was released on the super nintendo. I recently came acorss Super Mario Kart Universe and I had to try it out. Super Mario Kart Universe was developed by Tunest and was released on 03 February 2010. There are no new characters you can race as in this hack. In fact all the tracks remain the same but there layouts have been changed. In some mario kart hacks the tracks and AI are very poor. But in Super Mario Kart Universe the tracks are well designed and the AI works perfectly. The Mario Circuit 1 track is an interesting track. From the start you can take the left or right track which will then loop back to the start line, Is does not matter which way you go. The Donut Plains 1 track contains some long parts of track which enabled you to build up some speed, but watch out taking the corners as some can be slightly tricky. The Ghost Valley 1 track can be a bit tricky, you need to be careful as some parts of the track are not very wide which means you are more likely to fall off the track. The Bowser Castle 1 is one of the easiest super mario kart tracks I have ever played, you simply need to drive around in a square and avoid the boulders which jump up and down. The Mario Circuit 2 is the final track in the mushroom cup and can be quite tricky. The bends are very sharp at the beginning of the track and the track is quite long. I would highly recommend this hack of super mario kart, the tracks have been well designed the difficulty is about the same as the original game which really makes this game feel like a super mario kart game. I would rate this game nine out of ten. Question : Can I download and play Super Mario Kart Universe SNES ROM Hack? Answer : Yes 🙂 You can download Super Mario Kart Universe ROM from ROMHacking. The download links have been tested and are working at the time of posting this article, If you find the links don’t work please let me know by posting a comment below. Question : What Emulator Shall I Use To Play Super Mario Kart Universe (ROM Hack)?